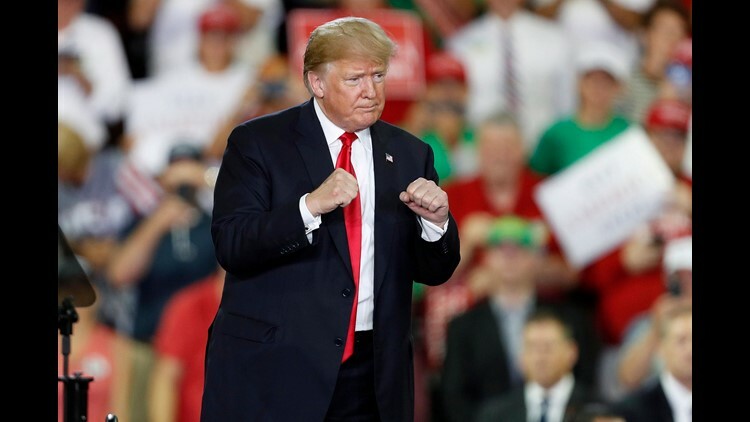 President Donald Trump speaks to supporters during a rally at the Erie Insurance Arena Arena in Erie, Pennsylvania, on Oct. 10, 2018. Nunes and Egyptian President Abdel Fattah al-Sisi leave a meeting in the U.S. Capitol on April 4, 2017. Nunes leaves the U.S. Capitol after a series of votes on March 28, 2017. Nunes talks to reporters in the Capitol Visitor Center on March 24, 2017, where he announced that former Trump campaign manager Paul Manafort offered to testify before the committee. Nunes leaves a closed meeting with fellow Intelligence Committee members on March 23, 2017, on Capitol Hill. Nunes speaks to the media outside the White House after meeting with President Trump on March 22, 2017. He stated that communications from members of Trump's presidential team were captured as part of "incidental" surveillance. House Intelligence ranking member Adam Schiff and Nunes talk with each other during a break in the committee's hearing on Russian meddling in the 2016 election on March 20, 2017. Schiff and Nunes speak to the media about the committee's investigation into Russian interference in the U.S. presidential election on March 15, 2017. Nunes answers questions at the U.S. Capitol during a press conference on March 2, 2017. Nunes talks to reporters outside the committee's secure meeting room in the Capitol Visitor Center on Feb. 27, 2017. Nunes speaks to reporters after attending the GOP weekly meeting at the U.S. Capitol on Feb. 14, 2017. House Speaker Paul Ryan talks with Nunes and House Armed Services Chairman Mac Thornberry on June 9, 2016, as they prepared to unveil the national security plank of the Republican agenda. Nunes speaks on Capitol Hill on Sept. 10, 2015, during a committee hearing on cyber threats.